The FF 1628 deep fryer offer quite a lot for the money that consumers would pay for it. It can be used for many years and comes with many great features for the kitchen. It is also an appliance that is easy to use, so users do not need to look for instruction when frying fish, chicken, or anything else. Homeowners would also enjoy draining the oil without putting in the elbow grease, or even opening the lid for that matter. 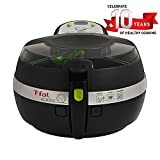 This is not the easiest deep fryer to clean, however, and there are many other models on the market that are better for cleaning. We all dream of tasting delicious fried foods at home, as if we went to a fancy gourmet restaurant or an authentic fast food joint that serves your favorite fries. 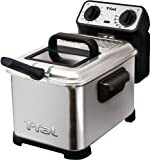 If you enjoy cooking and are wondering how you can deep fry chicken, fish, fries, onion rings and more in your very own kitchen, look into purchasing the T-fal FF1628 deep fryer. This amazing deep fryer comes with several features. This is a very sleek and modern looking appliance that will go great in any style kitchen with it’s simple shape and black body. The FF1628 is 13.5 inches tall by 15 inches long by 11.2 inches wide. These dimensions ensure that owners have the most room for food as possible while occupying as little of space on their kitchen counter as possible. The material is made of a non-stick aluminum coating that is not only durable, but will be resistant of food particles, dirt and grime over time. It will always be clean and always be in working condition. The FF1628 can hold up to 2.65 pounds of food in its carriage. It is also capable of holding 2.1 liters of oil. While a variety if different foods can easily get deep fried, this is a rather small capacity that limits how useful it really can be. It is big enough to serve three or four people, but not much more than that. If you are planning to fry a lot of food, you will need a plan put in place to fry all your food for a single occasion. The FF1628 comes with a filtering mesh that separates the crumbs from the finished food products after each and every fry. This ensures that foods that are fried are not just slightly healthier, but also smell less unpleasant after frying. Its unique filtration system is the first of its kind. This system is sure to clean oil, which in turn makes the fryer last longer in the long run. The filtering mesh inside the fryer is also easy to handle and convenient to remove and insert. The oil container, however, is rather difficult to remove, making the deep fryer overall difficult to clean. Unfortunately, there is no custom preset feature. If there ever is another food that can be deep fried, or a user wants to deep fry, we suggest that he or she deep fries it from the “Vegetables” setting. This deep fryer has an LED screen that displays how much time is remaining on a user’s deep fry. The deep fryer will lasso beep continuously until the timer reaches zero. The FF1628 is safe to touch when it is deep frying foods. While the inside temperature reaches over 300 degrees, users will hardly feel any warmth due to the deep fryer’s professional insulation. It keeps heat inside and does not let any out, so users know that they can safely move it if they need to. The lid on this deep fryer cannot just be removable, but also can be locked if it is shut. This makes the deep fryer a little more versatile depending on what the user requires in delicious deep fried foods. The purchase of a new FF1628 comes with a one-year warranty. Still want to compare with other deep fryers? 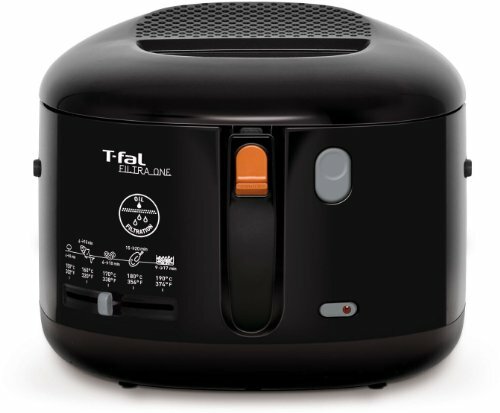 Check out our best deep fryer reviews.